First edition of Hersey’s classic work, which has sold over three million copies. Octavo, original cloth. Inscribed by the author on the title page, “For Debbie Keller John Hersey. Bookplate, near fine in a very good dust jacket with light wear. Jacket design by Warren Chappell. Uncommon signed and inscribed. 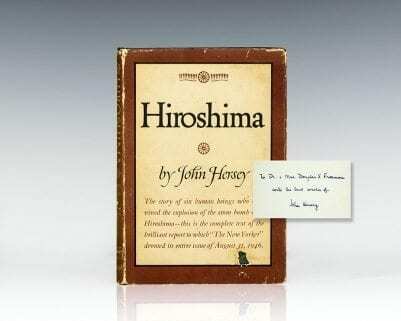 Hiroshima is a book by Pulitzer Prize-winning author John Hersey. It tells the stories of six survivors of the atomic bomb dropped on Hiroshima, covering a period of time immediately prior to and one year after the atomic bomb was dropped on August 6, 1945. "The quietest and the best of all the stories that have been written about the most spectacular explosion in the time of man" (New York Times Book Review). 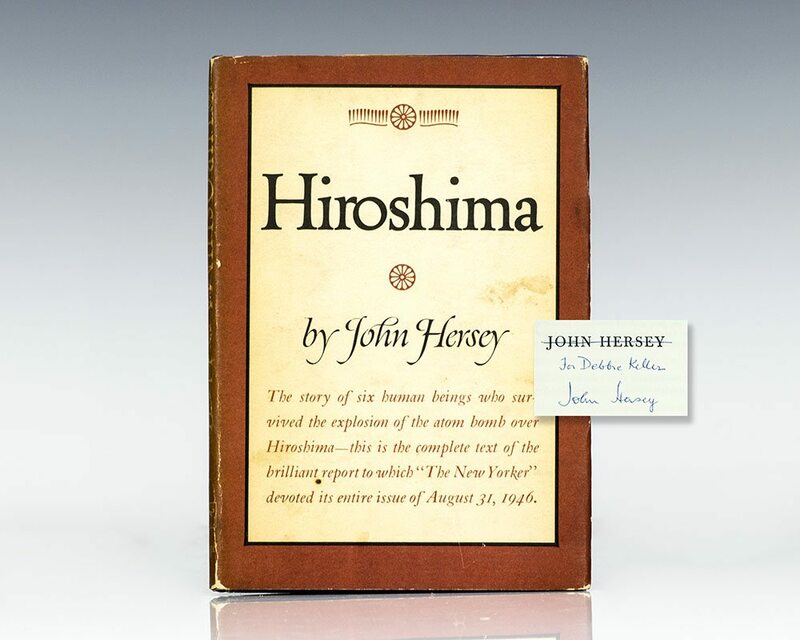 "John Hersey once described himself as a novelist of contemporary history In 1946 he visited Hiroshima, interviewed survivors of the first atomic bomb attack, and published the New Yorker article which changed him profoundly. In Hiroshima Hersey drew from the victims themselves the understanding of history that had eluded him as a war correspondent. The six Hiroshima residents told him how they had lived before the bomb struck, why they were not killed, and precisely how illness, exhaustion, and personal sorrow had qualified their survival" (Contemporary Novelists, 634). Early printing of Hersey’s classic work, which has sold over three million copies. Octavo, original cloth. Presentation copy, inscribed by the author on the front free endpaper, “To Dr. and Mrs. Douglas S. Freeman with the best wishes of John Hersey.” The recipient, Douglas Southall Freeman was an American historian and biographer. He is best known for his multi-volume biographies of Robert E. Lee and George Washington, for which he was awarded two Pulitzer Prizes. Jacket design by Warren Chappell. Hersey’s account of the aftermath of the atomic bomb dropped on Hiroshima, Japan, was adjudged the finest piece of American journalism of the 20th century by a 36-member panel associated with New York University’s journalism department. Near fine in a good dust jacket. An exceptional association copy.